Sitges is a very popular tourist resort set on the Costa Brava coast in close proximity to Barcelona which is only 30km north. On this page we give you a flavour of what to do and see in Sitges and show you visually what the town looks like by listing all the available webcams which will show you what the resort looks like – in real time! If you want to know what the weather conditions are like right now in Sitges then you simply click on the webcam and you will see exactly what is happening and whether it is sunny, cloudy or raining. Most of the cameras set in various popular locations are streaming real-time footage but some produce still images at set times of the day. Apart from the webcams we will also introduce you to Sitges by showing you video guides and images, pictures and photos so if you are considering visiting then you will get a good idea of what to expect. This town of Sitges is beautiful with many art-deco style houses and lovely plazas where you can grab a coffee (cafe con leche) and people-watch. 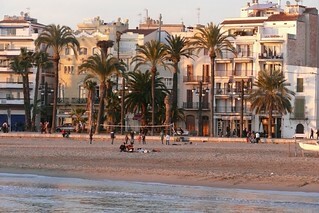 The resort has gained a reputation over the years for attracting many artistic people and this acceptance of different personalities and cultures had led to Sitges becoming one of the most prominent gay resorts in Europe. The wonderful beaches and climate are just the icing on the cake and the resort is equally a draw for families, for which there is much to do and see in the area. You can’t miss the 17th-century Sant Bartomeu i Santa Tecla Church which dominates the skyline when you are on the waterfront. Make sure you visit the Cau Ferrat which is a house once owned by the famous modernist painter Santiago Russiñol, here you can see many fine paintings and sculptures from the likes of Picasso and Greco. All the eleven beaches are good but Platja de St Sebastian is regarded as perhaps the pick of them. For festivities you can’t beat the Sitges Gay Pride Festival which takes place early in July. This Sitges web camera takes in the main promenade, beach area and popular local attractions. Sitges is known for its beaches, nightspots and historical sites such as Sitges Church, Santa Tecla and Mont Roig Pass. The Room Advice Service company have this webcam which overlooks the skyline of Sitges. “Our Webcam looks from Sant Pere de Ribes (Vallpineda) directly onto the center of Sitges. In the middle of the picture you see its landmark : La Punta, the church of Sant Bartomeu and Santa Tecla which was built on a rock, directly by the sea. Page Summary – This page contains links to webcams on the beach resort of Sitges near Barcelona as well as videos of Sitges. We show you Sitges webcams so people who have never been can see what Sitges looks like.